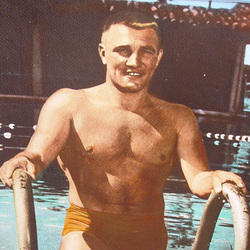 Jack Nelson, one of the all-time greats In University of Miami swimming history has been honored repeatedly for his achievements. Jack made his first splash internationally when he was the world's premier butterfly swimming star in the 1956 Olympics. Nelson started his swimming career at Lafayette IN. high school, but his colligate career was interrupted by a stint in the US Air Force. He was a member of the UM aquatic teams in 1958 and 1959 and reigned supreme throughout the south in the butterfly event. He also competed in the freestyle relay, turning in a highly respectful 100 yard sprint to help establish a school record for that event. No one could touch Nelson at any distance in UM dual meets, he went undefeated over two years and he was always the top man in southern meets. He scored for the Hurricanes in the 1958 NCAA championships with a 3rd place finish in the 200 yard butterfly. Jack was honored in 1958 with his selection as an All-American. As with most Hurricanes and Hall of Fame inductees, Jack has remained close to his Alma Mater.